Brad Park was a highly efficient defender, combining size and clean but dogged tenacity with an uncanny awareness of the game. A noted hip-checker, Park was brash and unintimidated. But with the puck he became a natural chessmaster on the ice. more-than-likely make a perfect pinpoint pass to clear the puck out of the zone and start the attack. With a short burst of speed he would often jump to join the rush as a fourth attacker, and was a true power play quarterback. Park, not unlike Ray Bourque years later, was a consistently steady defender with often brilliant offensive instincts. In almost any other time period Brad Park would have been considered the best defenseman of his time. But Park played in the enormous shadows of Bobby Orr in Boston and Denis Potvin on Long Island. The only thing that kept the spotlight on them as opposed to Park was their team success and a combined 6 Stanley Cup championships to Park's zero. That's right, Brad Park never had the chance to sip champagne from the Stanley Cup, despite participating in the playoffs each of his 17 NHL seasons. Along with the likes of Marcel Dionne, Gilbert Perreault, and Mike Gartner, Park may be the best player ever not to have tasted Stanley Cup victory. Park went from unbridled prodigy to popular sensation in New York, ranking him as perhaps the greatest defenseman in the long history of the Blueshirts. "Park reminds me of Pierre Pilote," once said Chicago coach Bill Reay. "Both were relatively compact men who could accelerate better than most forwards." Though it was popular with Manhattan fans, Park was brash off the ice as well. 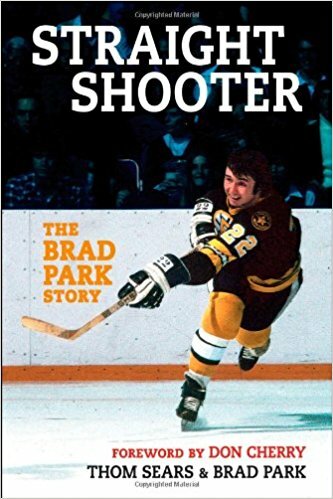 He penned the book Play The Man in 1971 where he was very forthcoming in his thoughts, notably badmouthing Boston fans, calling them animals and players, calling them thugs. The Bruins fans hated Park and their natural rivals from New York, which made the feud all the more ironic when Park would be part of a blockbuster trade with the Boston Bruins. Perhaps the biggest the trade to that date, Park was the centerpiece of a Ranger/Bruin swap that saw the legendary Phil Esposito leave Beantown. Looking to find a fill-in for the often injured Orr, the Bruins also sent Carol Vadnais to New York and also received veteran Ranger Jean Ratelle. The trade was uncomfortable for Park, who openly cried and considered not reporting. The two teams were bitter rivals. The only thing that could have been worse is if the Red Sox traded for a Yankee's starting pitcher. But Park's cerebral play would quickly win over the fans. But the Bruins got a different, more mature Park than the one who so often dominated games against them. Park's play in Boston tamed down somewhat, mostly due to necessity. By the time he was 28 he had undergone five major knee surgeries and four arthroscopic surgeries. But his play remained sterling, in some ways better than ever under the Bruins tight checking system. "My wheels aren't as good, but my brain is better," Park said at the time. "When I was younger and quicker I was capable of controlling a whole game over the whole rink. Now I've got to be content to control our zone. Basically I'm prepared to do less and do it well rather than try doing what I used to do and do it badly." Park served another seven and a half seasons with the Bruins. He would finish his career in 1985 after 2 seasons in Detroit. In a total of 1,113 NHL games, Park netted 213 goals and assisted on another 683 for 896 points, while accumulating 1,429 penalty minutes. He also posted 125 points (35 goals, 90 assists) in 161 playoff contests. Park was a First Team All-Star in 1970, 1972, 1974, 1976 and 1978 and second team in 1971 and 1973. He would be shutout from Norris trophy nods as the game's best defenseman, but finished 2nd place a heartbreaking six times. He was awarded the Bill Masterton Trophy in 1984 and was also a valuable member of the Team Canada defense corps in the 1972 Summit Series against the Soviets.